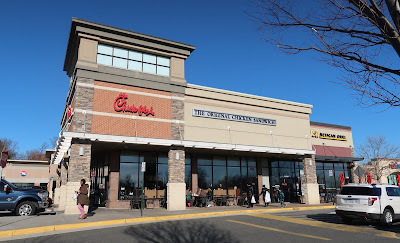 the Annandale Blog: Is Chick-fil-A a good fit for central Annandale? Is Chick-fil-A a good fit for central Annandale? The Chick-fil-A on Arlington Boulevard in Seven Corners doesn't have a drive-through. 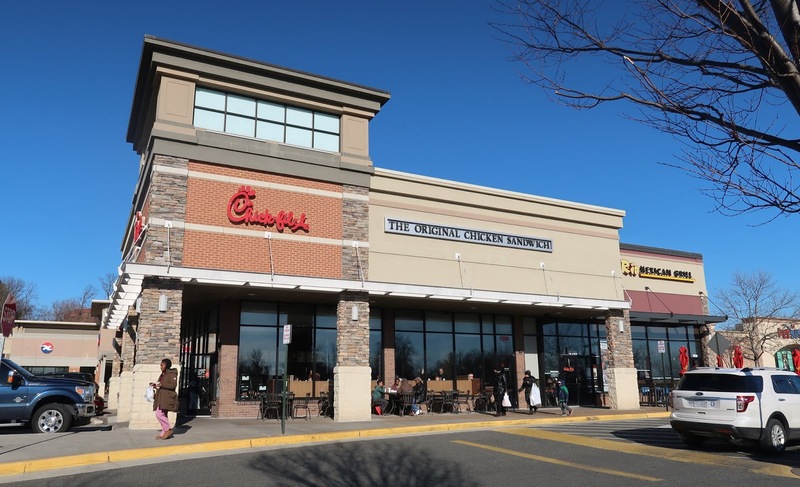 The proposed Chick-fil-A for central Annandale would have dual drive-through lanes and outdoor seating, according to the zoning special exception application submitted to the Fairfax County Department of Planning and Zoning by Sheri Akin of McGuire Woods, the agent for the company. The 4,400-square foot fast-food chicken restaurant would replace a collection of antique shops in two buildings on a 1.2-acre site at 7120 Little River Turnpike across the street from Popeyes. The menu features chicken sandwiches, salads, waffle fries, and milkshakes. The Seven Corners Chick-fil-A is busy on a Saturday afternoon. The property is zoned C-6 (highway commercial) and needs approval of a zoning special exception because of the proposed drive-through, Akin says. “With the Chick-fil-A proposal, the site will be revitalized and improved with landscaping, open space, and an attractive building design,” the application states. In addition to the two buildings on the property, one of which was built in 1900, the site is completely paved with surface parking. 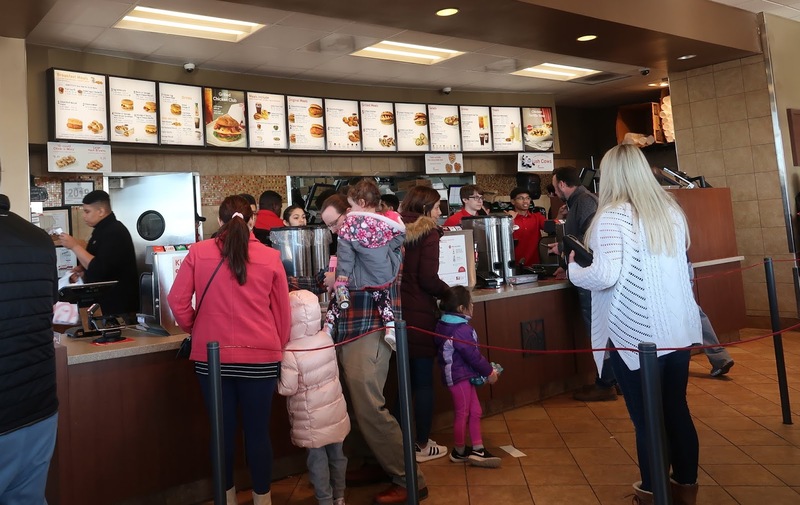 “Based on Chick-fil-A’s experience with similar restaurants in the area, approximately 500 patrons per day will visit the restaurant and 800 will go through the drive-thru,” the application says. The restaurant is expected to have approximately 75 employees, including 12 to 15 per shift during peak hours. According to the estimate of traffic impact in the application, the Chick-fil-A would generate approximately 2,300 trips per day, including 212 trips during the morning peak hour and 152 during the p.m. peak hour. The restaurant is expected to serve the surrounding area within a 15-mile radius. The statement acknowledges provisions in the county’s Comprehensive Plan for the Annandale Community Business Center that call for residential, commercial, or mixed-use development and discourage auto-centric uses. The application calls for street trees, a 10-foot sidewalk, and additional landscaping along Little River Turnpike. It also proposes traffic improvements, including a dedicated right-of-way. hey look something else that goes against the comp plan that will be approved! More mass transit needs to be established closer to central Annandale to encourage the type of mixed-used development seen, for example, in the Mosaic District. I am fine with not granting the zoning special exemption and not allowing the drive-thru lanes in an effort to prevent the Chick-Fil-A from not being built; as long as the responsible public officials can honestly state that they have good reason to think a better development proposal for the parcel will be submitted within the next 7 years; or honestly own the decision and say they prefer the current eyesore, or a by-right development that may be worse than the Chick-Fil-A proposal, for the foreseeable future, than the current Chick-Fil-A proposal. Sometimes, you have to be able to say “No” to something that may be “better” than what currently exists, to have the future you really want. That may well be the case here for central Annandale. CFA would be an excellent fit for Annandale. We need revitalization in this area and a company with a proven track record and a following is the way to start. Ridiculous to block this. I travel to the Fairfax Circle (rt. 50) Chick-fil-A (drive-thru) and drop $50+ almost every Saturday after sports for the kids/family. If Annandale doesn't want my $$$ then I will continues to travel from Falls Church --> Fairfax. Stop stepping on your own feet Annandale. It doesn't look like the subway will go to downtown Annandale, so we are stuck with cars. CFA is trying to make the area more walkable though -- give them credit. This is a terrific addition to Annandale. It removes an eyesore that has been there for over 30 years, will provide a wonderful restaurant, and will have drive through lanes like every other fast food restaurant in the area has. Even CVS has a drive through. There are no better options than this for this space. Many people want a Wegmans in the KMart space -- do you have any idea how much traffic that would generate? Even so, it would be a good addition. The only conversation worth having is what will replace the Popeye's once Chick Fil-a puts it out of business. Expedite this application please. Once one good thing comes to this hellscape of a dilapidated shopping center ghostown, more things will come. I'm glad someone with CFA saw the potential of this area and is willing to be the leader in revitalization of this tumbleweed village. After CFA will come the first follower, who sees the success and increase of patrons and influx of spending to the area, and that will draw the next few establishments. Pretty soon, we'll actually have something that's not a community embarrassment on these parcels of land. And the comparison of Popeyes to CFA is laughable. How has Popeyes ever improved an area? What beautification and increased sidewalks have they done? Community engagement? Fundraisers? Support of local schools? Just because two places serve chicken doesn't mean one is redundant. The two chains target different demos and tastes. I hope all you chick lovers are going to vote for PG again so we can get more fast fooderies in downtown Annandale. @158, HELLSCAPE. That's a new one. Also, you realize the comment above yours was anti-popeyes, right? Another fast food poisoning joint serving e-coli with bloody diarrhea. Yes! Bring it on. We need something good since Wendy's left. That Burger King is the worst, they must never clean their soda lines or fryer grease. Be happy its a chicken place and not another title max, a Penny Gross favorite. For those concerned about traffic, this is an interesting read. It is an Annandale Community Business Center Circulation Study, Prepared for the Virginia Department of Transportation, Prepared by MCV and Associates, May 2005. Cannot imagine what a similar study would reveal today!!!! Will it pay $15.00 hourly or more to the staff?